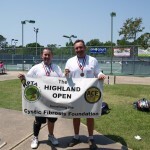 exceeding its “65 Roses Campaign” for the second year in a row. 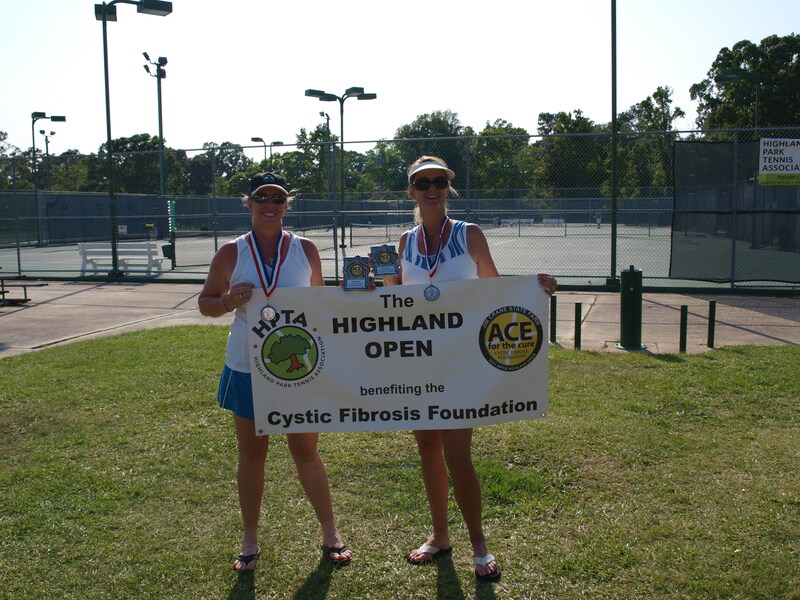 Accepting the Angeles Lago Hodges “Breath of Life Award” on behalf of HPTA and the “HOTT Team” were (left to right) Debbie Klotzbach, HOTT team member; Joycelyn Leblanc, HPTA Round Robin Coordinator; Lisa Sanner, Highland Open tournament director; and Rusty Jabour, HPTA president. 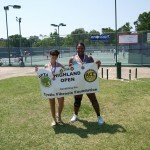 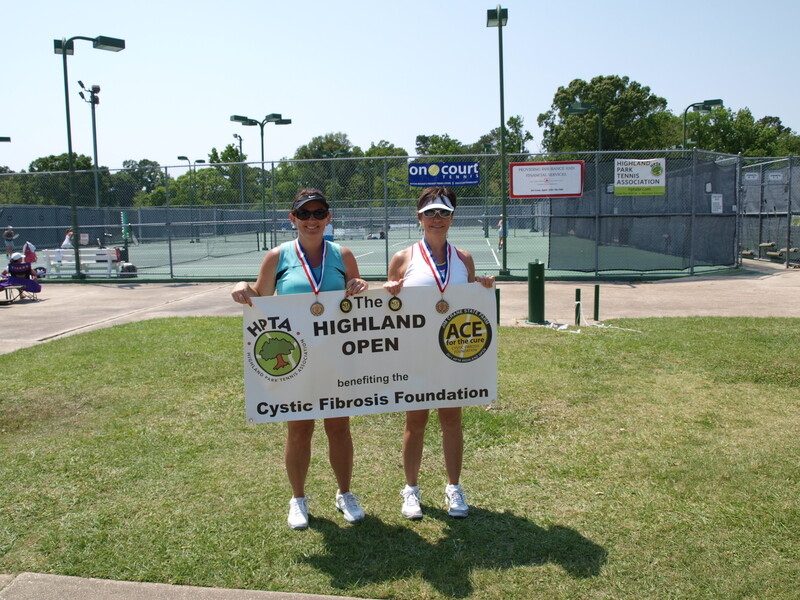 Despite a rainout (with hail) Friday evening, the tournament resumed Saturday morning with gorgeous weather and an opening round of pro-sets to get back on schedule. 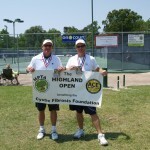 By noon, the tournament was back on regular schedule and continued that way through its end on Sunday afternoon. 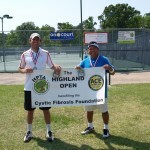 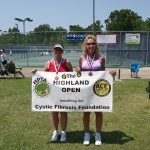 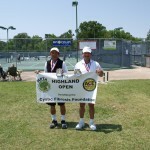 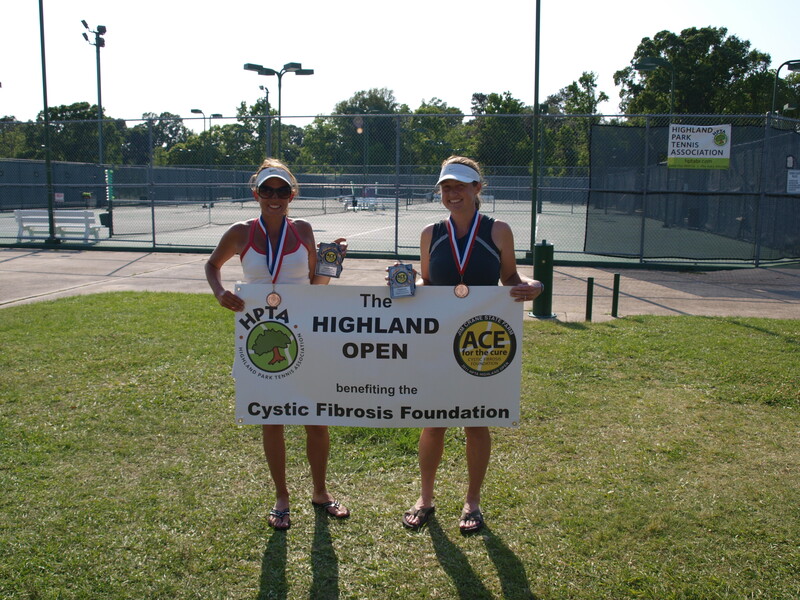 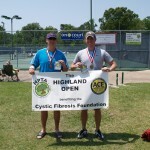 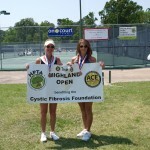 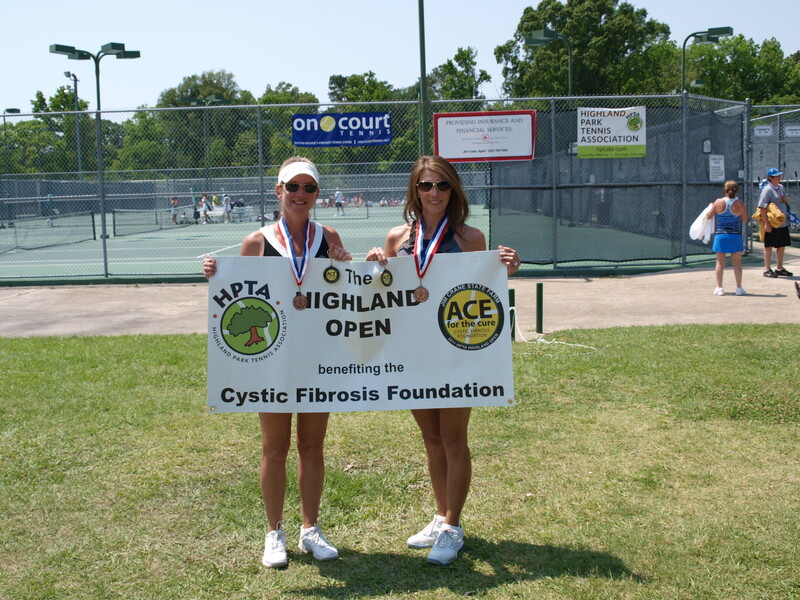 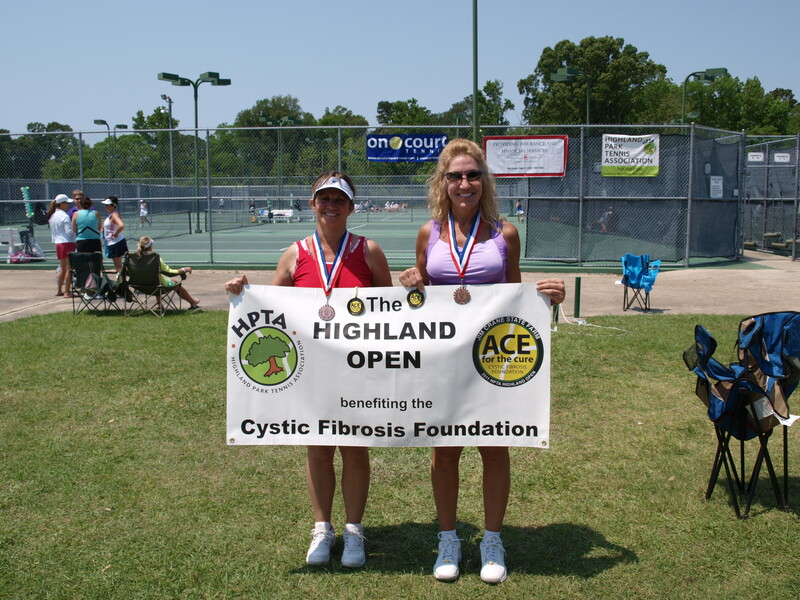 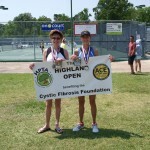 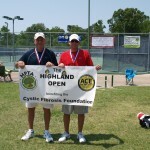 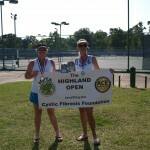 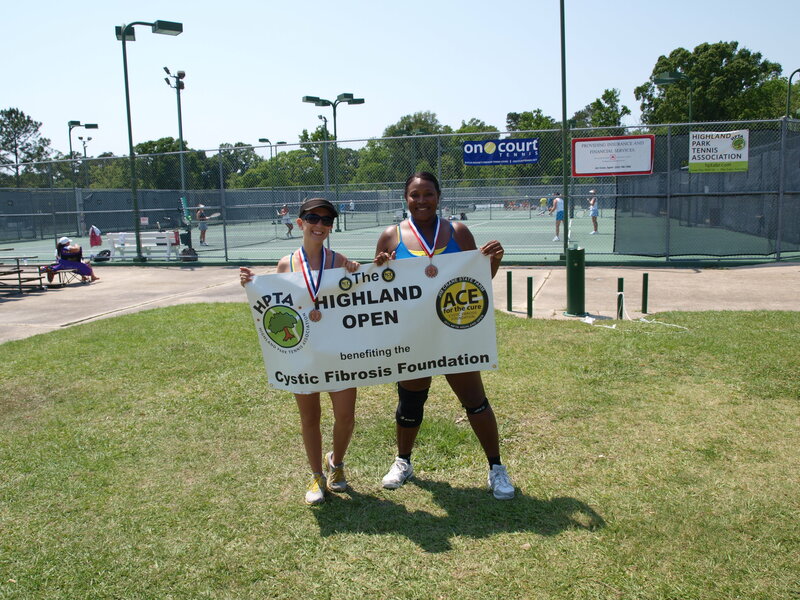 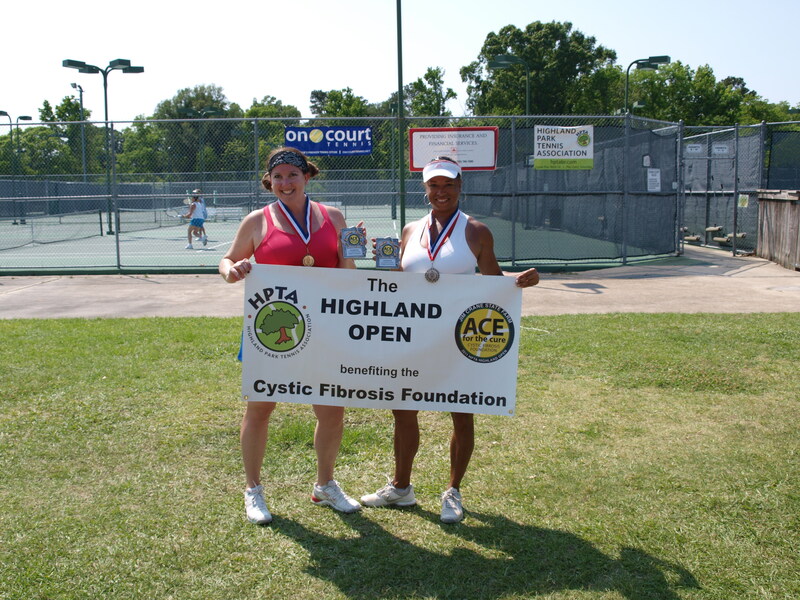 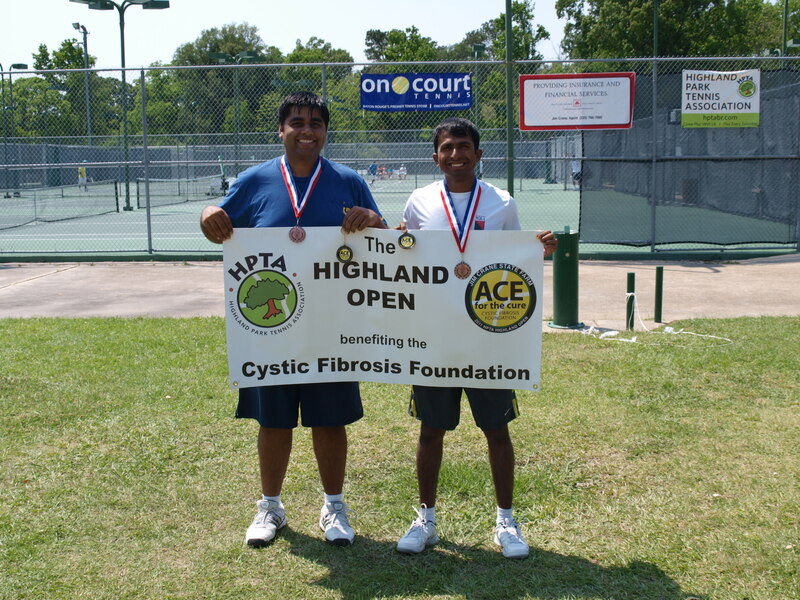 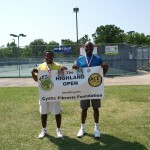 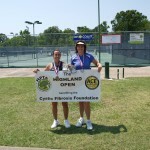 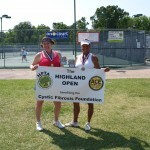 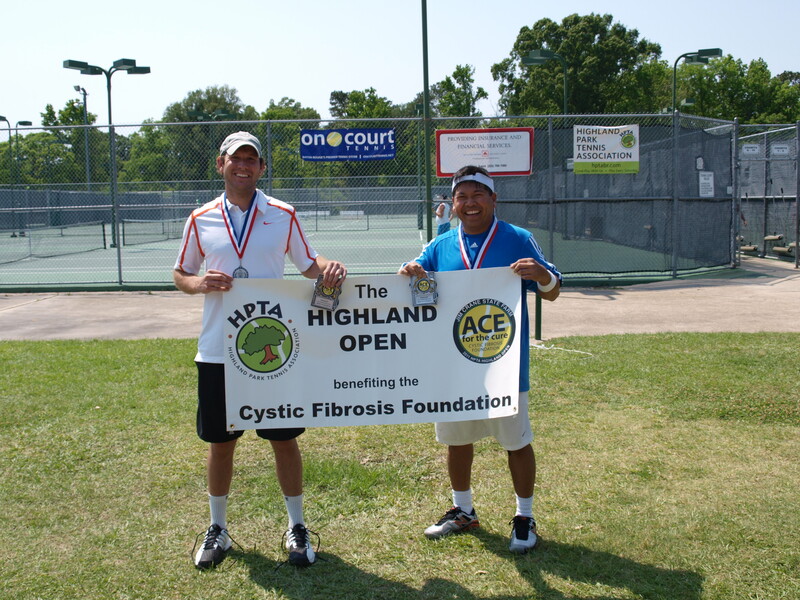 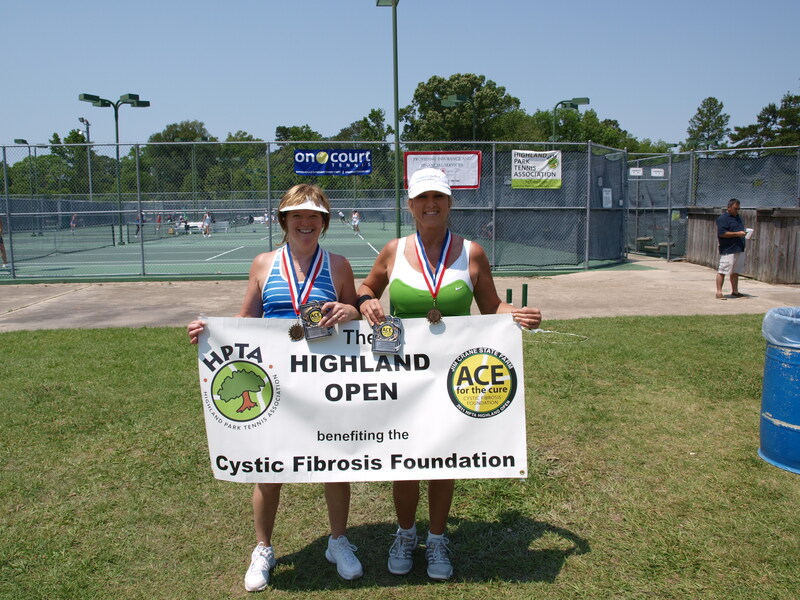 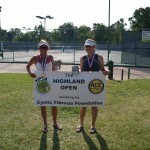 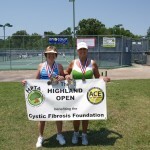 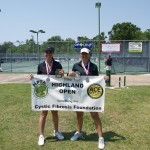 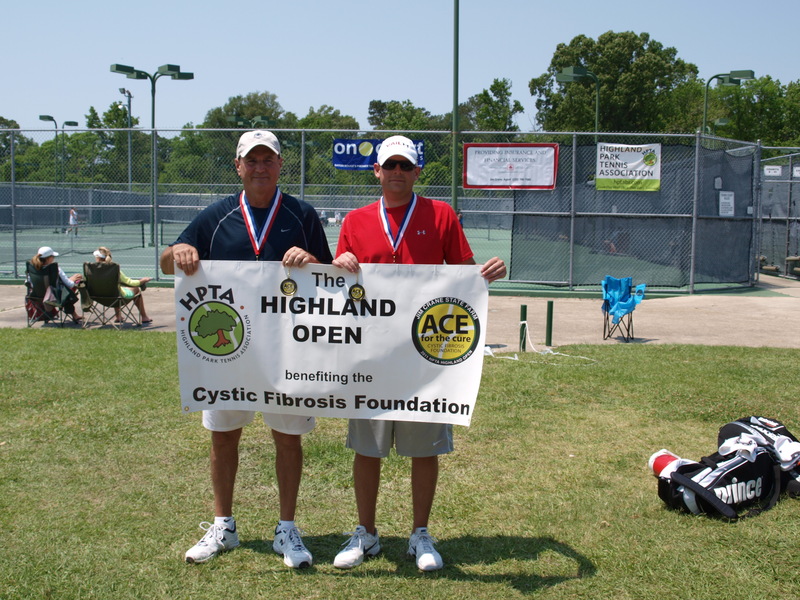 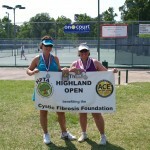 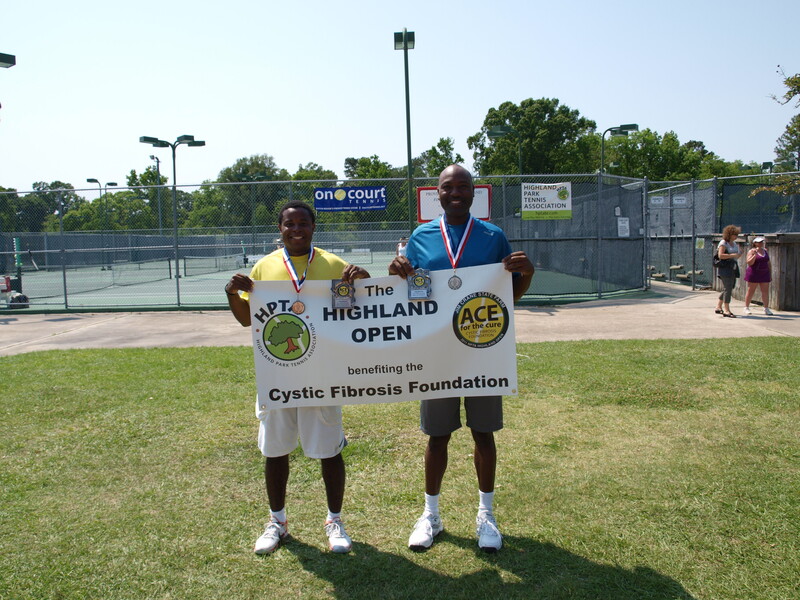 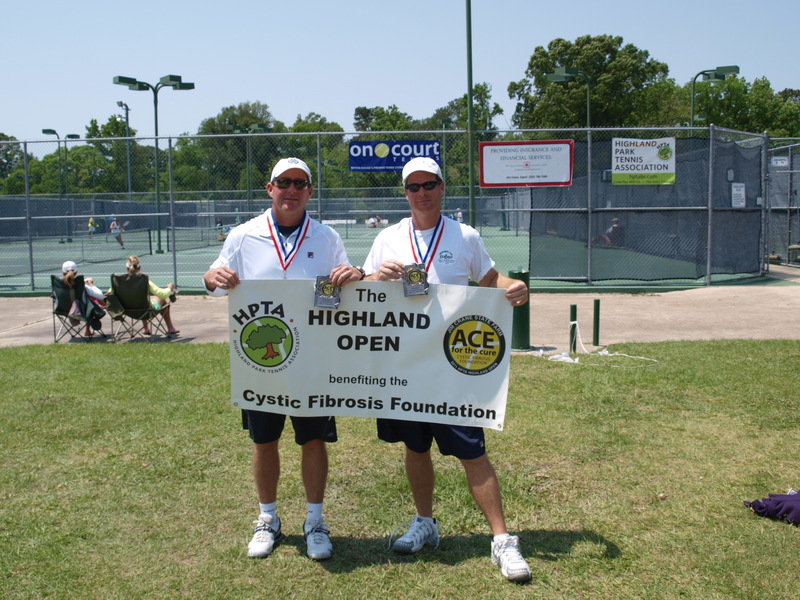 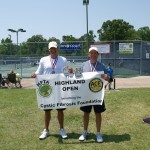 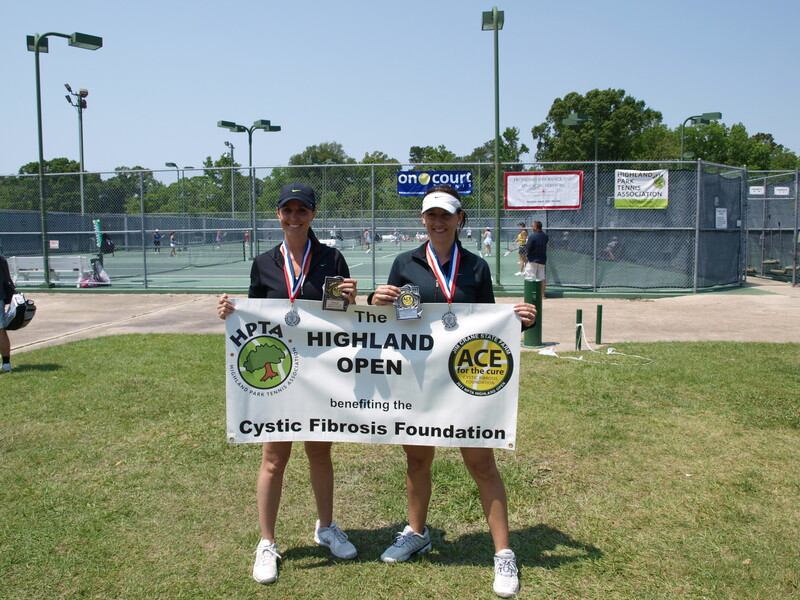 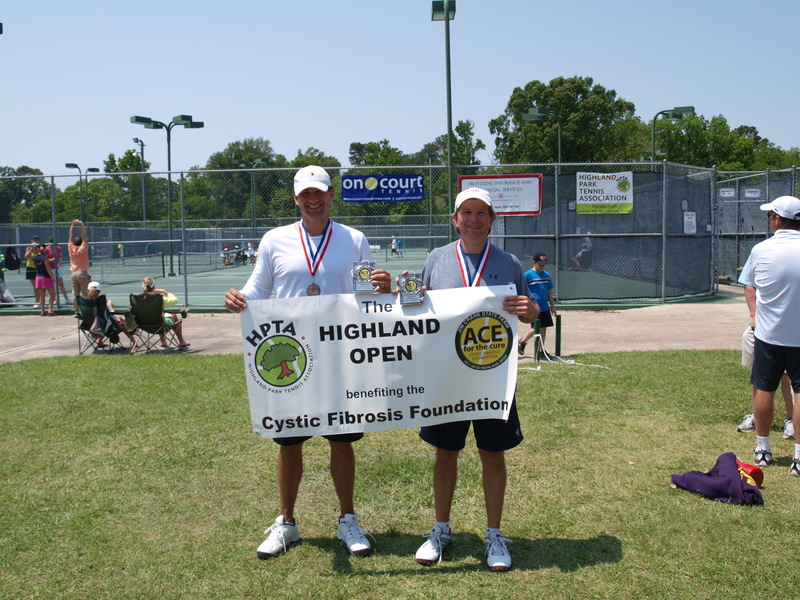 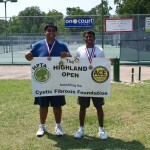 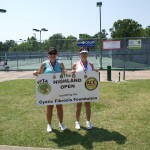 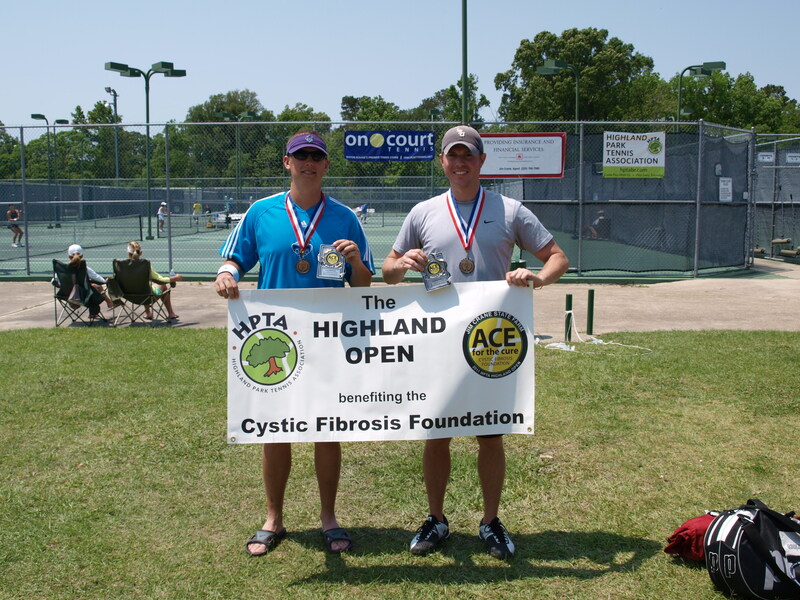 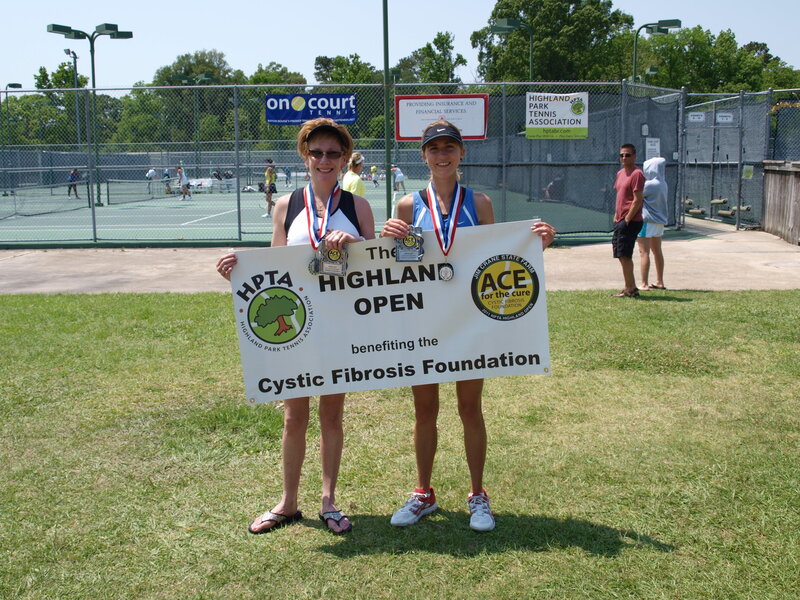 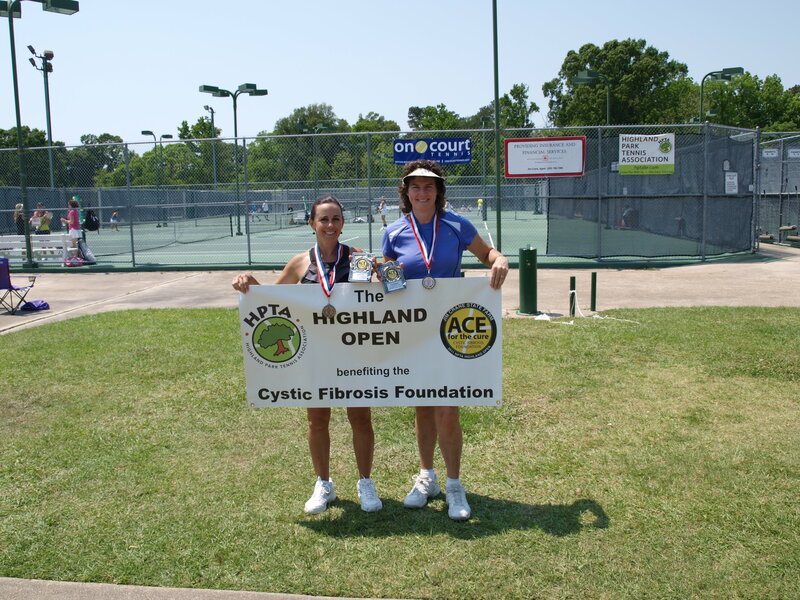 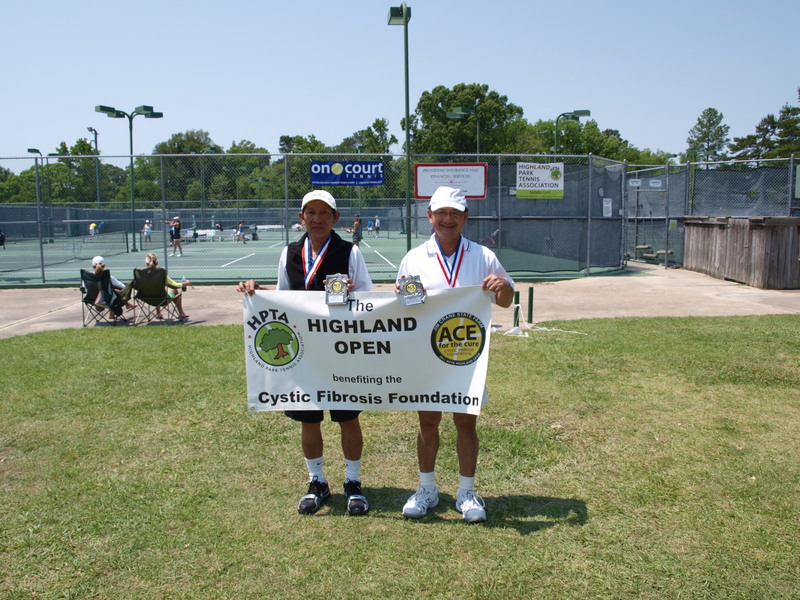 The tournament’s 29th year was a terrific success, raising $23,000 for the Cystic Fibrosis Foundation — the largest amount ever raised through the Highland Open. 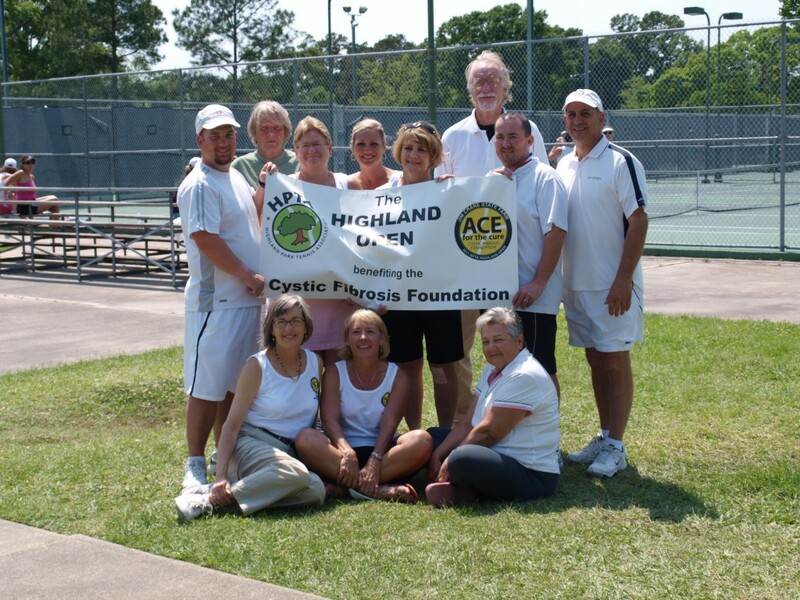 This fundraising success would not have been possible without our generous sponsors and donors, our field of more than 250 players, and our 86 Rose Sponsors. 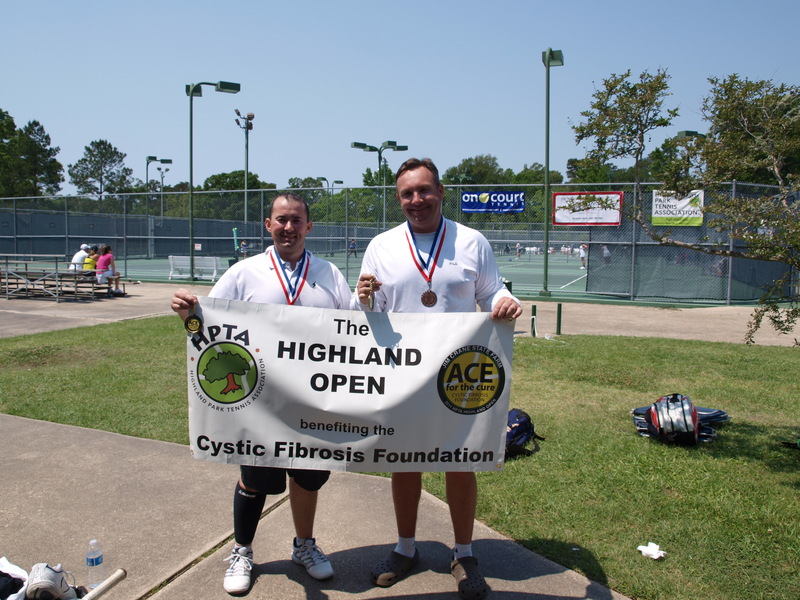 We are very pleased to report that we exceeded our “65 Roses Campaign” goal for the second year in a row (84 in 2010, 86 in 2011)! 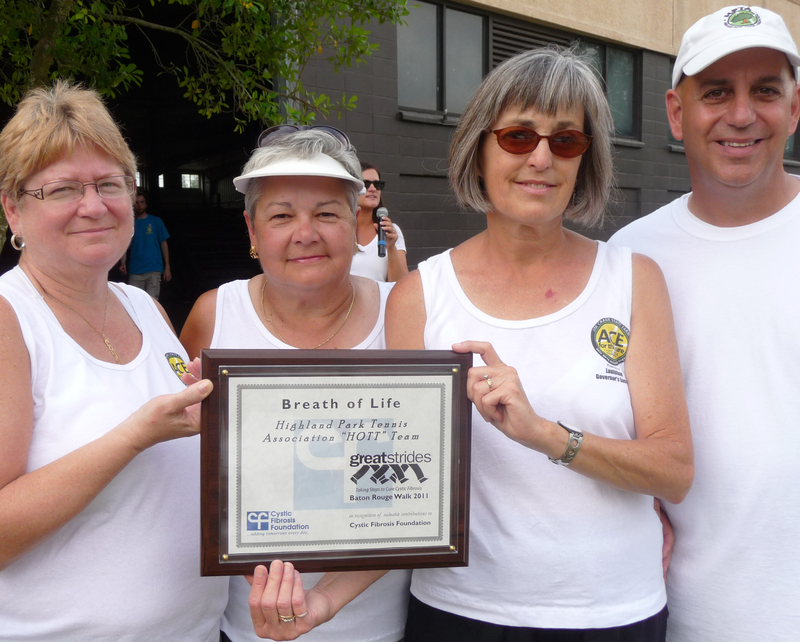 HPTA’s HOTT Team also was deeply honored to have been awarded the 2011 Angeles Lago Hodges “Breath of Life Award” for outstanding volunteer service. The award, named after Mrs. Hodges who was a remarkable volunteer for CFF, was presented May 21 in Baton Rouge at CFF’s Great Stides Walk on the LSU Campus. 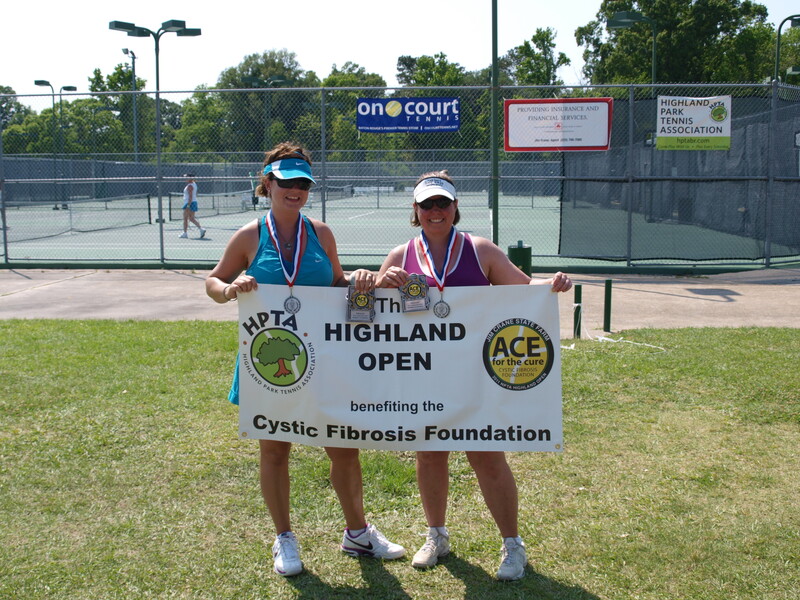 The 2011 HOTT Team seated (l-r) Tournament Director Lisa Sanner, Wendy Parrish and Joycelyn Leblanc. Standing (l-r) Chris Floyd, Mike Doyle, Debbie Klotzbach, Angel Ellis, Sandra Harshbarger, Fred Aldrich, Brad Dupont and Rusty Jabour. 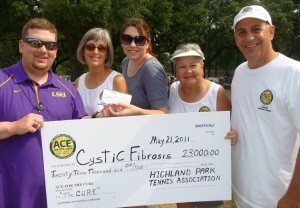 Not pictured David Oliver, Robert Wu, Darlene Cunningham, Bo Boehringer, Barry Valure and Mike Grimes.